Hacienda Entry Structures – Finn Design Group, Inc. 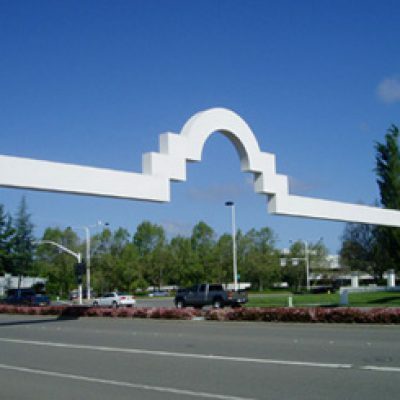 This project consists of an evaluation of the four existing steel monument structures located at key entrances and intersections of the Hacienda Business Park in Pleasanton. The first part of the project was to evaluate the current condition of the existing paint systems on the structures including any defects (paint chipping and flaking, rust, etc.). Recommendations were then made regarding future maintenance and painting of the structures. An evaluation of the structural condition of the structures was also conducted. A baseline laser survey was performed using a pulse total station to measure the current deflections of each structure. A finite element analysis for each structure was also performed to predict these deflections. The measured results and predicted values were then compared to determine the current condition of the structures. These results will also be used in the future in comparison with surveyed results to monitor the structural condition of the structures.